I have been reading through Isaiah, Jeremiah, and Ezekiel this year for Bible reading and have noticed that God tells each one of them that the people will not listen to them (and even resist them). In a recent Bible study on Jeremiah, I asked the group about times when they feel like people do not appear to want to hear God’s Word. 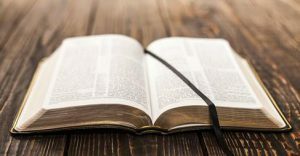 Jeremiah writes, for example, about a time when the remnant that is left behind in Jerusalem after the Temple’s destruction comes to ask him for a word from God. He gives them one, and then they proceed to disregard it entirely (Jer. 42-43). In response to my question above, my thoughts went immediately to family devotions. Like most parents, I have had a number of experiences with family devotions that have ranged from encouraging to lackluster. Sometimes I feel that no matter what I try the interest is just not there. Like other parents, I do not feel like it is an option to give up trying to teach the Bible to our kids. Below, I will provide a brief list of items that we have tried and indicate which of these have been highlights (at least from my perspective). Next, I will talk about what I am learning from our current devotions with teenagers. 1. Our best devotions of the year have been during Advent. We have celebrated the four weeks of Advent since our kids were little. For whatever reason, the Christmas season has helped us to have good family times of Bible reading and singing. 2. We have tried reading books of the Bible after dinner along with some brief discussion. We have read several books, but by far the most popular was Proverbs. Proverbs led to some good questions and good discussions. 3. When our kids were younger, we had some success with Family Nights Tool Chest books by Focus on the Family. A few of the ideas that these books provided led to memorable times together. The lessons rely heavily on your kids’ ability to draw analogies between activities that you do and a Scripture passage. 4. We celebrate Passover together each year on the Thursday before Easter. Those evenings have been special. We always invite guests, which helps our kids to tune in. They like to be the experts. So, as you can see, our holiday events have been some of our most memorable times of family devotions. The rest of the year tends to vary widely in terms of interest and quality of discussion. We are now experimenting with family devotions with teenagers. This new stage is challenging us to change our approach and to experiment with some new ideas. Every so often we stumble on something that catches their attention and leads to good discussions. In particular, our kids seem to be more interested when the topic is one that they come up with or one that they have questions about. It has become more difficult to encourage them to read through an entire book of the Bible together. It is always interesting to ask them about what they are studying at church or in youth group. Since we were not there, they have to recount what was taught and what they thought was important. The encouraging part about these opportunities is that it does appear like they are learning, which further affirms us in our resolve to continue teaching the Bible.